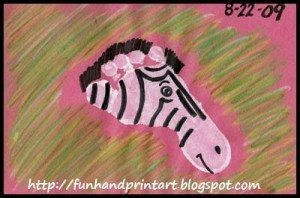 To make this Footprint Zebra, first place a white footprint on a colored piece of paper. When it dries you can either paint or draw on the stripes, hair, and facial features. I used Nupastels around the zebra. These are precious! I did the unicorns with my kindergarten class and they were a HIT!